You will be offered an abundance of delicious items from our spacious kitchen. Everything from coffee, juices, fruits, bagels, muffins, cereals, jellies and an aray of other items to enjoy while eating in our lovely dining room or the dining tables set up in our Great Room. 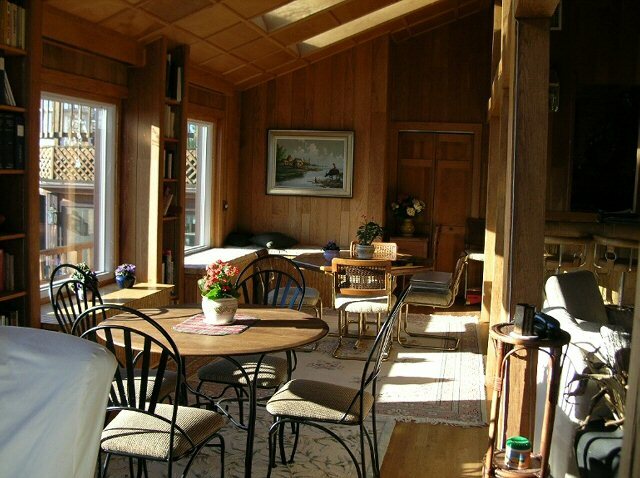 From the dining area you will be amazed by the views of mountains all around, including Pilot Mountain N. C. and The Buffalo Mountain in Willis, Va. The view above the Blue Ridge Parkway from the kitchen is spectacular. You will want to linger in the kitchen enjoying the views while planning your day. DINING ROOM WITH SPECTACULAR VIEWS WHERE YOU MAY ENJOY BREAKFAST WHENEVER YOU LIKE. DINING SPACE IN GREAT ROOM. VIEW OF CAHAS MOUNTAIN AND DINING AREAS IN GREAT ROOM. DINING ROOM AND VIEW OUT ONTO DECK FROM MAIN KITCHEN.